The nose, with its unique and individual topography, presents particular challenges for reconstructive and skin cancer surgeons. A number of approaches can be adopted, but how does the dermatologic surgeon choose the best for any particular defect? Reconstructive Conundrums in Dermatology: The Nose provides an atlas compendium of novel approaches to these challenges. Based on the Reconstructive Conundrum series published in the journal Dermatologic Surgery, a range of cases provide photographs of the defect before and immediately after reconstruction, and two long-term, follow-up images. The authors provide a detailed explanation for their choice of reconstruction. The Editors’ commentaries allow residents and experienced surgeons alike to compare different reconstructive alternatives and to explore the thought processes behind them. 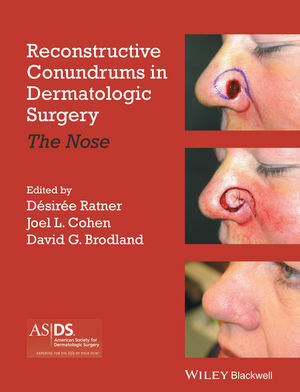 Jam packed with clinical wisdom and surgical pearls, Reconstructive Conundrums in Dermatologic Surgery: The Nose provides a guiding hand to anyone faced with daunting surgical reconstructions. Desiree S Ratner, MD, Director of Dermatologic Surgery at the Columbia University Medical Center, Co-director of the Multidisciplinary Melanoma Center at the Columbia University Medical Center, Clinical Professor of Dermatology at the College of Physicians and Surgeons of Columbia University. Joel L. Cohen, MD Director of AboutSkin Dermatology and DermSurgery in Englewood and Lone Tree, Colorado and Assistant Clinical Professor, University of Colorado. David Brodland, MD, Assistant Clinical Professor, Department of Dermatology, University of Pittsburgh and Department of Dermatology UPMC Shadyside Hospital, Pittsburgh, PA.